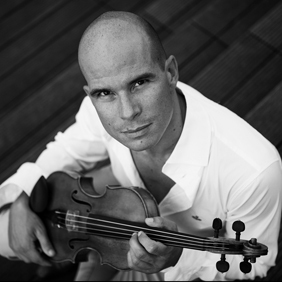 Lyonel Schmit started to learn the violin at the age of 7 with Patricia Reibaud. As a young teenager, he successfully entered numerous music competitions: Ufam, Lutèce, Nerini… His further studying with André Pons at the Conservatoire in Metz led him, aged 14, to a unanimous First Prize with congratulations from the jury, and to a special invitation to give his very first violin recital in the renowned Arsenal in Metz. Then came the entrance exams to the Conservatoires in Paris and Lyon. He had to decide between the two prestigious schools and finally opted for Paris and Devy Erlih’s class. Having obtained the highest awards, he pursued postgraduate studies with Regis Pasquier. He then won the first Avant-scènes competition and gave a violin recital in the Paris concert hall “Cité de la Musique”. He became acquainted with famous masters such as Eduard Schmieder, Ida Haendel or Shlomo Mintz. Moreover, his meeting with Michael Hentz and Ivry Gitlis, who still guide him today, led him to a necessary introspection. Since then, he has received support from several foundations (Cziffra, Charles Oulmont, Drouet-Bourgeois, Zilber, French Instrumental Foundation…) and thanks to their precious help, the young 21-year-old virtuoso has distinguished himself in several international competitions. He was awarded first prize in the R. Lipizier competition in Italy and won the prestigious Bach prize unanimously in the Tibor Varga competition in Switzerland; he also was successful in the European competition for young soloists. From then on, his career spread out at international level and led him to perform in prominent auditoriums such as the Concertgebouw in Amsterdam, the Barbican Hall in London, the Suntory Hall in Tokyo, the Colon Theatre in Buenos Aires, and also in France where he played in the Arsenal in Metz and in Paris in the Gaveau Auditorium, the Châtelet Theatre, the “Cité de la Musique”… He also performed on France-Musique, France-Culture, and appeared in the TV shows Musiques au Coeur on France Télévision and Mezzo. His inquiring mind and his eclectic taste in music have brought him to perform as lead soloist for the Opéra de Marseille orchestra; he also enjoys playing in the “Nouvel Ensemble de Montréal” and the “Sillages Ensemble”, both ardent defenders of contemporary music. A sideline interest in composition led him to compose a collection of Tzigane music for the “Editions Lemoine”, whilst the Musikalia Festival commisioned him a musical tale. Another notable venture was the Piazzolla Forever programme he performed and recorded in 2004 for the Dreyfus label with accordionist Richard Galliano and his septet. Lyonel Schmit mostly performs in a classical chamber music repertoire with great artists such as Gérard Caussé, Augustin Dumay, Henry Demarquette, Michel Dalberto, Dmitri Makhtin, the Debussy Quatuor, Vahan Mardirossian… Nevertheless, contemporary music plays an important part in his artistic life. He has performed with the Sillages Ensemble in a record dedicated to the music of Jean-Luc Hervé (2005). His 10-year friendship and collaboration with composer Florentine Mulsant found a notable achievement in 2007 with a record for the AR-RESE label in association with cellist Henri Demarquette. In 2009, he met Julien Guénebaut with whom he now forms a duet.